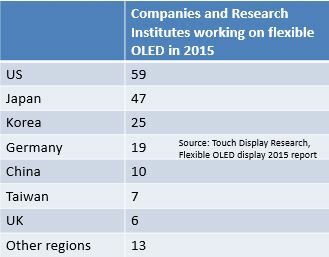 Flexible OLED Display attracted over 180 companies and research institutes - Touch Display Research, Inc.
Santa Clara, California, August 31, 2015—In the newly published “Flexible OLED Display Technologies and Market Forecast 2015 Report”, Touch Display Research analyzes flexible OLED display technologies, manufacturing process, other competing technologies, and shows how the flexible OLED display market is accelerating. This report profiles over 180 companies working on flexible OLED displays. USA is the most active country in flexible OLED display research and production, with 59 companies and research institutes involved. Japan is number two, and Korea is in third place. Figure 3. 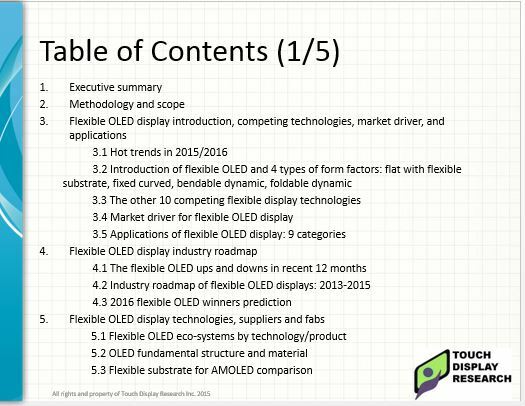 Flexible OLED Display 2015 Report Table of Contents (Full TOC and report sample are available upon request). 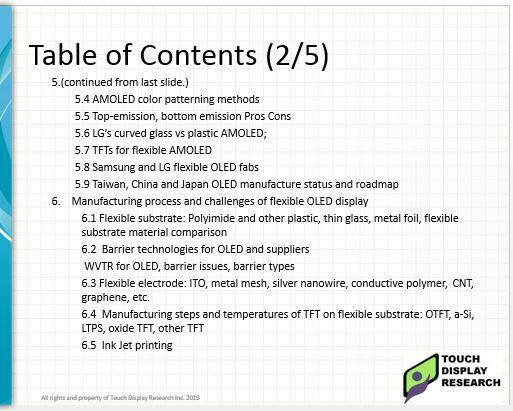 This report provides a detailed analysis of the key process steps for manufacturing flexible OLED displays. Flexible substrate, TFT backplane, organic materials, barrier properties, encapsulation, and production bottlenecks are analyzed in this report. Flexible OLED display ecosystems, suppliers, and the status of Samsung and LG fabs are provided. Flexible batteries, flexible touch screens, and flexible OLED lighting technologies are also analyzed in this report. This report provides a regional analysis for the U.S.A., Japan, Korea, Germany, Taiwan, China, the U.K., and other countries. Market data in the report includes historical data from 2013-2014 and forecasts from 2015 to 2025. The market forecast includes Units, ASP, Revenue, Area (square meter), with a detailed breakdown by AMOLED and PMOLED and breakdown by four form factors. The market forecast includes a detailed breakdown in nine application categories: smart watch, TV, Monitor/AIO PC, NB/tablet PC, mobile phone main display, phablet and tablet, automotive, public signage, and other applications. Five size categories are included: less than 4.99 inches, 5 to 9.99 inches, 10 to 19.99 inches, 20 to 49.99 inches, and greater than 50 inches. Touch Display Research experts have been writing flexible OLED display industry analysis report for over nine years. You can access this expertise by purchasing and receiving the report today. A license for company with less than five users is $4200 for this report. The license for five or more users is $5200. The table of contents and report sample is available upon request. Touch Display Research, Inc. is an independent technology market research and consulting firm specializing in touch screen and emerging display technologies such as OLED displays, OLED lighting, flexible displays, e-paper displays, ITO-replacement, 3D displays, near-eye displays, pocket projectors, quantum dots, gesture controls, voice controls, and eye controls. Touch Display Research provides standard reports, consulting projects, and due diligence for touch suppliers, display manufacturers, consumer electronics ODMs/OEMs, material suppliers, investor companies, venture capitalists, and companies who are merging or acquiring companies in the touch screen, display, and materials industry. We are member of Flextech Alliance and SID. Our website is TouchDisplayResearch.com.